A little bit of Paradise on the road to Hana! A must see while on Maui! Garden of Eden: Maui’s scenic wonderland on the road to Hana! Visit us on your drive to Hana and feel a special peace and the spirit of old Hawaii as you delight in our lush Maui Garden Of Eden. Experience the natural beauty of Maui – the way it was meant to be, a paradise.Twenty-six acres of trails alive with brilliant colors, unique flowers, rare trees, and the sweet aroma of tropical blossoms in a uniquely natural island setting. We invite you to slip away from the crowds, relax and take in some of Maui’s most breathtaking ocean views and photo opportunities. Look upon the opening sequence of the film, Jurassic Park. Come walk and explore over 26 acres of Maui’s finest nature trails, enjoy our picnic areas and one of the most colorful and extensive collections of Ti plants on the island. It was a perfect destination for our family on the Road to Hana. With a boy who easily gets car sick, we knew we wouldn’t be able to complete the whole Road to Hana. The beauty and views are incredible. There is no better place to see all the tropical vegetation of Maui and they display it in such a careful and curated way. As a horticulturist I fell in love with this spot. I make it a must stop upon my annual return to Maui. This place is an easy hike for all. I love this place. It is a great break on the drive to Hana. The plants are beautiful and the trails are well groomed and relaxing to walk around. There was a time when this area was densely populated by large Hawaiian settlements. Today there are very few residents but many archeological sites in evidence throughout this region. It is in places like this that the spirit of old Hawaii may still be experienced.We are happy to have you here with us. Stop by and smell the wild Hawaiian roses! Come back again on your next visit and see how our gardens have grown. The second largest and most popular of the Hawaiian Islands, Maui is known for diversity… of cultures, activities, climates, and experiences. On the lush northern shore of this island, diversity continues to flourish. 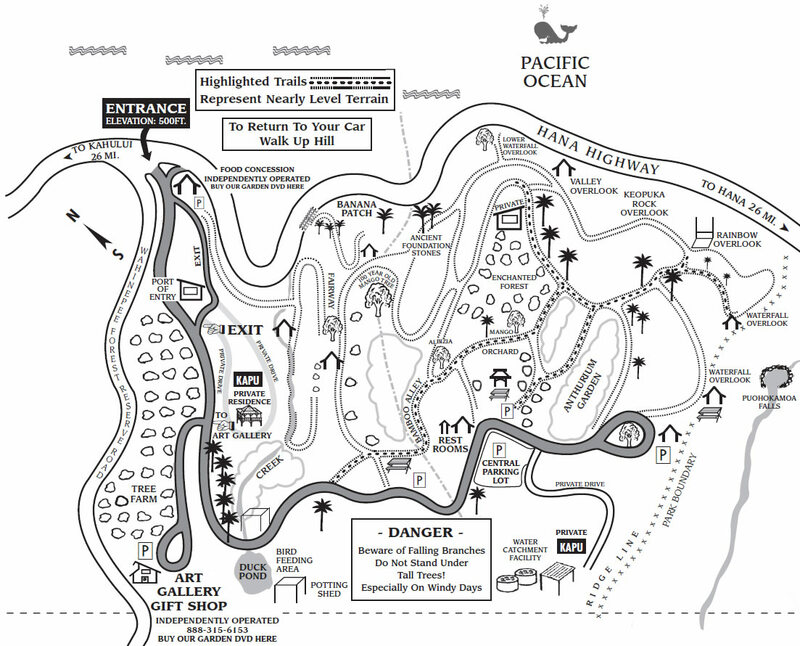 The aptly named Garden of Eden Arboretum & Botanical Garden is the creation of Alan Bradbury, Maui’s first I.S.A. certified arborist and landscape designer. Alan purchased the 26-acre site in 1991 with a vision of restoring the area’s natural ecosystem with Hawai’i’s native and indigenous species. Along the way the opportunity arose to include exotic plants and trees from the South Pacific region and tropical rain forests throughout the world. There are currently over 700 botanically labeled plants, including the most extensive collection of Ti plants in Hawaii. Ti has a long history of usage by the Polynesians in ceremonies and rituals, and is still considered one of Hawai’i’s most culturally useful plants. Visitors to the Garden can roam through an elaborate series of meandering trails alive with brilliant colors, unique flowers, rare trees, and the sweet aroma of tropical blossoms. Panoramic vistas, including the sparkling Pacific, hidden waterfalls, and Keopuka Rock, of “Jurassic Park” fame, are a photographer’s dream. Open to the public since September 1996, the Garden of Eden received recognition from the State of Hawaii in 1995 for its conservation practices and proper land use and development techniques. Since opening, visitors from around the world have delighted in The Garden’s lush and beautifully landscaped twenty-six acres. Here, away from the crowds, one can still experience a special peace, and the spirit of old Hawai’i. Visitors can comfortably spend anywhere from 30 minutes to three hours. The Garden of Eden Arboretum & Botanical Garden is open daily from 8:00 a.m. to 4:00 p.m., and is located on the Hana Highway, between Kailua and Ke’anae (mile marker 10.5) 26 miles from Kahului. It is also a sought-after venue for retreats and other private gatherings.